A few nights ago, a combination of a clear, transparent, steady sky, 12 inches of aperture, and a good plossl allowed me to see Neptune's Triton and Uranus's Titania and Oberon. Under similar conditions, when Mar's is near opposition and using an occulting bar of some kind, should I be able to see its two moons? IMO Phobos & Deimos are much trickier than Uranus's four major moons or Neptune's Triton, because of the close distance to the much brighter planet. However both Phobos & Deimos are definitely possible with 12" in good conditions; I would imagine that an occulting bar would be essential. Thanks for starting this thread. 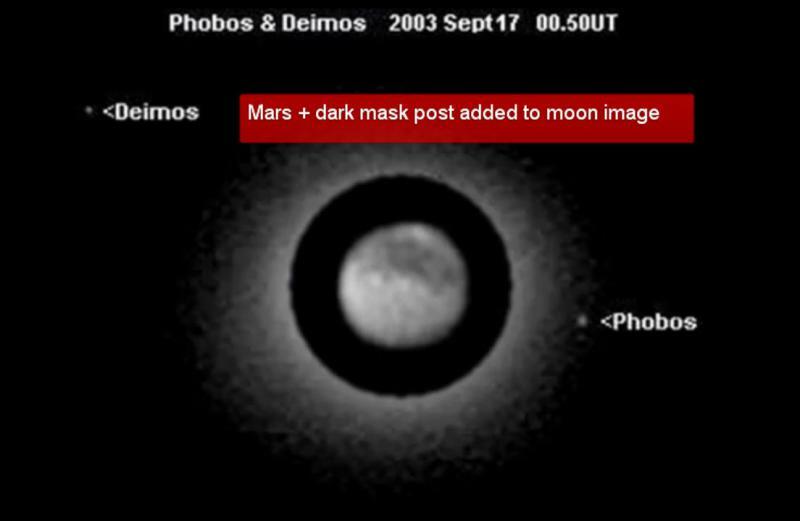 Phobos and Deimos are on my short list of objects I want to see too! I've heard a ten inch can pull it off. I'd wager an occulting bar snd high power would show it in my 8". It's one of those challenges I promise myself but the home made occulting bar puts me off. I should try it. I recall reading accounts of success someone had with a 13.1" coulter reflector. My scope does a nice job concentrating diffeaction pattern light into the spurious disk more so than say, an f/4 so I feel kinda confident. Lol I have the bother of a flimsy occulting bar thingamajig dampening my interest though. I'm confident with care and good seeing u can see it. I'd bet something like 500x is in order to help produce the higher contrast diffraction *moon pattern*. How would you make the occulting bar? Would you just stick some small black tape on the glass of a cr@ppy low FL eyepiece? Ive got a wratten filter threaded retaining ring that screws into the bottom of my eyepieces. A filter sans the glass. At anyrate I'd solder some tin or somesuch bend it into place and adjust focus of the occulting bar by turning the ring. Course adjustment by bending the tin . Trick here is to keep the bar FLAT across the focal plane or as Thomas Jensen mentions in another thread that the out of focus bar however slight would dim the very dim points of light you seek. When it works, it should work well! Getting there though is the uphill of it all. It's a little amazing Televue doesn't offer such a screw in device. More folks would consider if it existed at all commercially. They can be seen in a 12 or 15-inch telescope, but the problem you will have is glare from Mars. They are 13th magnitude objects and that will make they hard to see. If they were orbiting the Sun on their own, they could be seen with an 8-inch from a dark site. Oh dear ... many TV EPs are totally unsuited to use with such a device. However a "self build" using a cheapish plossl / orthoscopic eyepiece is a very easy exercise, probably the most primitive "ATM" job that exists. You need to unscrew the field stop, cut a strip of kitchen foil or very thin card to a suitable length & glue it to the flat surface of the field stop. (Tack one end using contact adhesive, stretch flat & tack the other end. Screw the field stop back into place & adjust until the bar appears sharp. No need to touch glass, unscrew glass components etc. if using a suitable design of eyepiece in the first place. A "screw in accessory" is not going to work because the bar will necessarily be out of focus - it has to be in the plane of the field stop to work - this is why modern multi-element EP designs are unsuitable for this; the field stop is either inaccessible (between optical elements) or, in some cases, simply a notch cut into the glass of one of the elements. In the previous posts there are a lot of "should be able to", "I heard", etc., but I can't quite tell if anyone actually saw the moons. The only scope in which I have actually seen the "Moons of Barsoom" was a 24-inch Starmaster with a 7mm Pentax XL eyepiece (420x). It was not easy by any means, even being at opposition. The other planetary moons we looked at that night were much easier. The view was "straight up", no occulting bar used. The discussion makes me want to try the occulting bar in a smaller scope to see if it makes a difference. One sort of cool thing from that night was that after seeing the Martian moons early, we did a bunch of other solar system viewing for a few hours. At night's end, we decided to take a look at Mars one more time. In a period of about 3 hours Phobos had already moved from one side of Mars over to the other. I dont understand your disorientation with the thread. You did find the moons though thats good. At anyrate, if no one says they saw it, then it can be pretty safe they arent harboring a secrets or playing coy. To be more specific, my information on the martian moon observations was based on various books over the years fro experienced observers. Here too, CN has had some who have made the observations and reported. While your account with a 24" reflector is interesting, I find the accounts through medium aperture more engaging. Perhaps next time you can stop down your scope. I'm sorry if I offended anyone, I'm just hoping to see a few actual observations, as I think in the long run it aids in answering the original question. Something like "I did/didn't see it in such and such a scope with whatever eyepiece, with/without occulting bar." Since I found it difficult even in the large aperture, I thought the observation of value. I did indeed stop the scope down as well, off-axis masked to a 9-inch f/11 unobstructed light path. I had no success at that aperture. I look forward to trying your suggestion of the occulting bar and would love to hear if folks were successful, and at what aperture. Yes, I have seen both of them near a favorable opposition time in my 10 inch Newtonian, although Phobos was somewhat difficult unless an occulting bar was used. Clear skies to you. Thanks David, that is indeed encouraging. Having acquired an old 10-inch f8 Cave this past year, I look forward to giving it a whirl next time Mars comes around. Ive never given it a go, but Ive never seen it by chance either. I would have to believe that the magnification to reveal a faint stellar point in a wash of glare would be considerably higher than the optimum power for general planetary contrast. Atr anyrate, the Cave sounds like its as good as itsd going to get for that kind of thing short of a refractor. is there such a thing as software occulting bar? For bright planetary targets, I don't understand how you can image a faint point source,like a small moon, so close to the bright planet... Longer exposures needed to capture the faint moon will just cause Mars to get massively overexposed... So what and how would you go about trying to image such targets? Does a Ccd occulting bar type of solution exist? If you go to the imaging forum and put that query there you may see a movie an amateur made of those moons shuttering around in orbit. An occulting spot was used. Software won't erase the over exposure but can attenuate it. This will give you a starting point for playing with this simulator. Next, change the date/time to see the moons change position around Mars. Phobos and Deimos move quickly. Best chance for a successful sighting is catching them as far as possible from Mars in their orbits. and a 3.5 Vixen LVW at 588x. Knowing when to attempt the sighting is a large part of the battle. Using the simulator to predict the opportunities can be very helpful. Good Luck!! Nice simulator. Thanks for sharing that site, Ed! I've seen both in the same fov with Mars without an occulting bar. It was a club observing night with very low humidity, scope was an AP 10" Mak-Cass, ZAO's in a MkV binoviewer. The combination of low scatter air and low scatter optics made it work. Another club member was the first to notice them. Outstanding photo and really enjoyed your video. Well do e sir.